The Duo Barrenechea, formed by flutist Sérgio Barrenechea and his wife, the pianist Lúcia Barrenechea, has been performing extensively since 1989. Besides working as musicians with intensive artistic activities, they are teachers and researchers, involved with the formation of young musicians and researchers. Refer to publications to look at their academic production. Duo Barrenechea participates in the 2017 Toronto Latin American Flute Festival presenting a concert and masterclasses, Toronto, Canada. The Duo Barrenechea released in April, 2016 the book of music sheet "The Flute and Piano of Francisco Mignone", containing works that are presenting in printing for the first time. Look for more information about this publication below. The New CD and DVD "Brasileiríssimo: Encontros" is available! The Duo has participated in an array of events such as the Iowa Flute Festival (1997) and the meeting of the Brazilian Music Education Association - ABEM (1995). 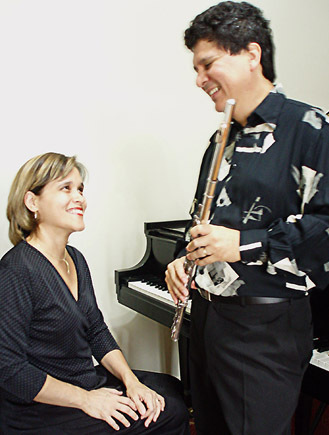 The Duo Barrenechea has performed in the IV and the VIII International Festivals of Flutists (2000 and 2008), promoted by the Brazilian Association of Flutists - ABRAF, the 24º Panorama da Música Brasileira Atual-UFRJ (2008), and many editions of the International Music Festival - CIVEBRA (2002-2005, 2007 and 2009) in Brasilia. Read articles about it on Boletim Faperj On-line , Rio Pesquisa Rio Pesquisa Ano 4, nº 15 and Folha de São Paulo. 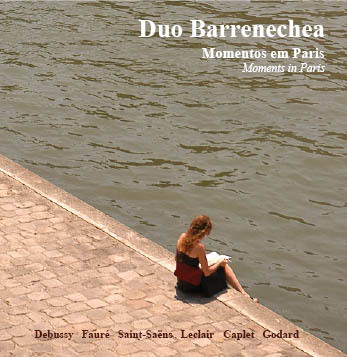 The Duo Barrenechea has released, in 2008, their first CD “Moments in Paris”, with French repertoire for flute and piano. The Duo presented recitals in several music halls in Brazil and in the U.S., such as Teatro São Joaquim in the Cidade de Goiás, Museu de Ciências Naturais-RJ, Sala Martins Pena at Teatro Nacional in Brasília, Museu da República-RJ, SESC Pinheiros - SP, Teatro Goiânia in Goiás, Cine Bangguê in the Espaço Cultural in João Pessoa - Paraíba, Centro Cultural da Justiça Federal-RJ, Harper Hall and Clapp Hall at the University of Iowa, at the New York University and at the Universidade Federal de Goiás. The Duo Barrenechea aims to explore a wide repertoire for flute and piano, including the promotion of Brazilian music. They also performed the first auditions of works by Dawid Korenchendler, Estércio Marquez Cunha, Alexandre Lunsqui, Rafael dos Santos, Fernando Morais and composers of "Preludio 21" group. The Duo has recorded to the TV Senado´s program Conversa de Músico , the TV Uniao Planetaria and Radio MEC. The Duo has also presented chamber music recitals in collaboration with other musicians, such as members of the Quinteto Villa-Lobos and Quinteto Brasilia, clarinetists Pedro Robatto, Fernando Machado and Fernando Silveira, bassoonists Francisco Formiga, Flávio Lopes de Figueiredo Jr and Elione Medeiros, cellists Watson Clis and Ricardo Santoro, and the flutists Rogerio Wolf, Itzzes Gergely and Maurício Freire. The Duo Barrenechea is available to recitals, recordings, lessons and master-classes. For contact, send us a message. For more information about us, photos, audio and video files, keep browsing our pages, or visit our pages at Myspace and Youtube.